The Urban Valley Resort & Spa offers a spacious and tranquil setting with amazing gardens and scenic landscape views over the Wied Ghollieqa Nature Reserve, a perfect place to relax and unwind. This modern hotel offers plenty of facilities to help you on your way with a choice of one indoor or two large outdoor pools or if you like to keep active then try out the tennis courts or fitness facilities. The Spa offers a steam room and sauna, which can be used by hotel guests free of charge, and from the 1st May 2019 many spa treatments will be available. Food is an important aspect of most holidays and at the Urban Valley Resort & Spa Malta you will not be disappointed. Breakfast is served in the Silver Heron restaurant and they offer a wide range of options as well as a specially selected 'eat healthy' section for those looking for a delicious and nutritious start. For the evening there are a variety of hot and cold dishes to suit all tastes along with the specially crafted and prepared, and recommended, choice of delicious sweets and cakes. Light lunches, snacks and pastries made by the resorts dedicated team of Patissiers are available from the Thistle Bar and TRI restaurant during the day. An amazing array of cocktails can also be purchased. In the evenings you can try out the informal Viento Bar - a Gin and Rum Bar. Travelling as a family, as well as the pools and gardens there is Leela's Hut, a wonderful play area allowing children to play and explore. A kids club is also available meaning there are plenty of places and activities to keep the kids happy, occupied and enjoying their stay as much as you will. Pets are part of the family and the hotel is dog & cat friendly. Want to Explore? The hotel offers a free shuttle service from the resort to nearby Sliema Ferries, St Julian's and Valletta meaning visiting and sightseeing is made simple. The Urban Valley Resort & Spa provides a great place for relaxation along with the ability to get active or explore, with so much to offer you are sure to make memories in Malta. 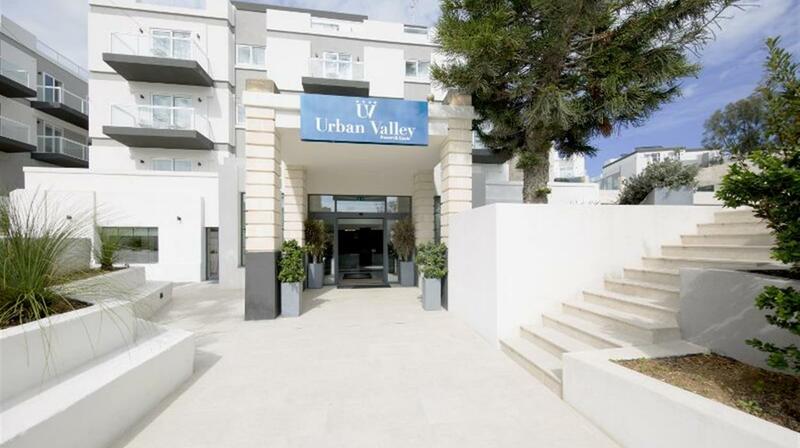 All rooms at the Urban Valley Resort & Spa include a balcony and tea/coffee making facilities in the room. Superior Rooms - available with village or valley view (supplement applies.) A high quality room offering a comfortable space, the room includes TV Unit, minibar, working desk, in room safe, hairdryer, bathrobe & slippers and bath or shower. Sleep max 2 guests. Junior Suites - A larger room averaging 40sqm, designed to accommodate small families in a stylish and comfortable environment. Including all the ameneties of the superior room with the addition of a sofa bed which can accommodate a third adult or 2 children. An ensuite bathroom with a bath and shower, two TV units, minibar, working desk, and balcony or terrace also compliment this suite. Sleeps max 3 adults or 2 adults & 2 children. Wi-Fi is available free of charge throughout the hotel. Specially adapted rooms are available on request and the resort is wheelchair friendly. San Gwann is situated just inland from Sliema. It's mainly known for being home to some of Malta's cart ruts, thought to date back to the Bronze Age, which are shrouded in some mystery with the curious groves defying clear explanation but there is some suggestion of the cuts being used for a form of prehistoric vehicle. San Gwann is also the site of a remarkable troglodyte church, Tal-Mensija Chapel, dating back prior to the 15th Century. It's certainly a town with some history attached. In San Gwann, Malta you will find the Wied Ghollieqa Nature Reserve. The Urban Valley Resort & Spa provides unspoilt and beautiful landscape views over the reserve. Its location nearby to Sliema means there is easy access to all of Malta's towns and local attractions. Thistle Lounge Bar - located in the lobby, the bar serves drinks and coffee as well as light snacks such as specially made pastries. Open from 09:00 to 22:00hrs. Silver Heron - Provides a variety of breakfast options including a specially designed 'eat healthy' section offering nutritious, yet delicious, breakfast ideas. For Dinner, a wide range of dishes, hot and cold, are served freshly prepared with many ingredients coming from the hotels own greenhouse & garden. Open 07:00 to 10:30hrs and 18:00 to 21:30hrs. MEA - An à la carte restaurant with a stylish, but comfortable, setting offering Mediterranean flavours with a wide selection of innovative signature dishes. Open 18:00 to 21:30hrs. TRI - The ideal place for 'al fresco' dining on a sunny day serving up a number of light lunches, snacks and cocktails. Open 10:00 to 18:00hrs. Viento - A Gin and Rum bar with a wide range of amazing cocktails and fine wine list. Ideal for an informal evening, including free Wi-Fi. Folding or put-u-up type beds are provided when 3 or more are sharing a room. The hotel dress code does not allow shorts or sleeveless tops in the restaurant during dinner. Please note hotel bedroom and outlook images are for illustration only. Holiday accommodation varies and the rooms allocated may differ to the images shown. Children should be accompanied by an adult, at the pool, at all times. There is no lifeguard. Outdoor pools and facilities may be closed in winter.